The National Theater, one of the city's most beautiful buildings. Accent on a building façade. I'm not sure of the architectural time period, but can assure you it predates WWII. Government buildings; isn't it obvious? Storefront that somehow survived the regime change. Perfect example of the old and the new: give these buildings, which face one of Sofia's many sparkling new malls, a coat of paint and they'll be right as rain. Although I haven't travelled to other former Soviet Block countries, I imagine that their cities are similarly stratified, none more so than what once was East and West Berlin; my grandmother shared chilling accounts of passing through checkpoints at the Wall in her youth, when she worked as a photographer in the film industry. 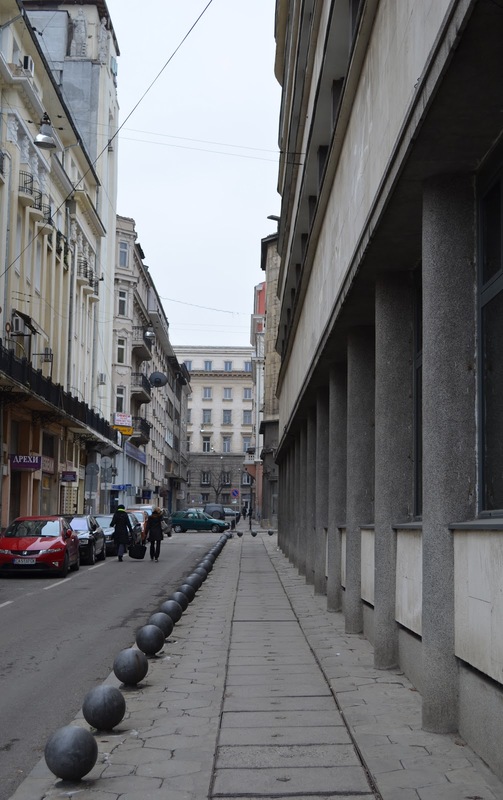 In Sofia, as in Berlin, there remains an unseen but palpable social, architectural, and psychological wall separating the decades of Communism from the last 20 years. Fortunately, change is visibly underway. As I've written before, Sofia is growing into a modern, happening, vibrant city , and with this new spirit, it has taken on a rather cheeky sense of humor as it looks to the past. 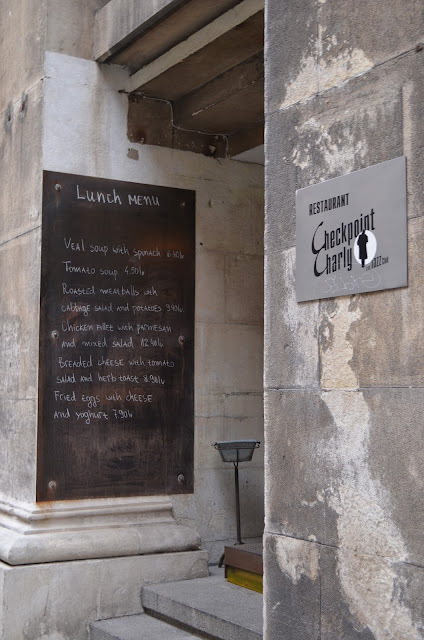 While the brutal tearing apart of Berlin is no laughing matter, Checkpoint Charly, a Sofia restaurant named (although with a slightly different spelling) after the notorious border crossing at the Berlin Wall, manages to convey the spirit of that age with charm and a menu that has yet to let me down. The restaurant offers something for everyone, with vegetarian and meat-based dishes, plenty of appetizers to tease your palate, and a mix of international and Bulgarian cuisines. The interior decor pays homage to bygone days in its mix of cold, whitewashed walls, exposed brick, and place settings that are actually copies of Communist-era newspaper clippings. I couldn't wait to take the photo and cut right into this delicious Viennese Schnitzel. Crispy on the outside, tender on the inside, with a dollop of butter and a sprinkling of lemon juice. 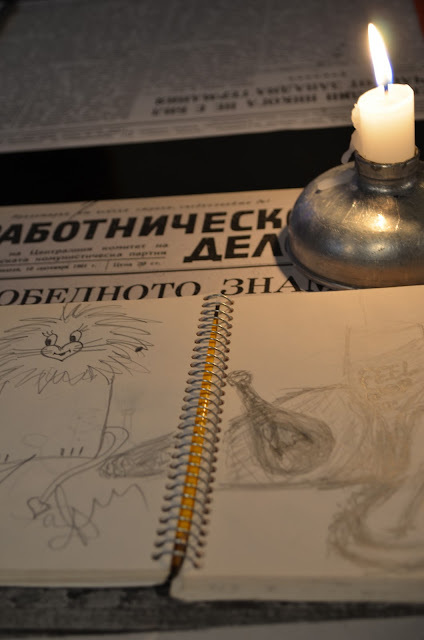 Although I would encourage all first-time visitors to Sofia to try more traditional Bulgarian restaurants, Checkpoint Charly is a great go-to place if you don't speak the language or would like to step back in time for just a little while. - Ivan Vazov Street, No. 12. - The menu is available online. 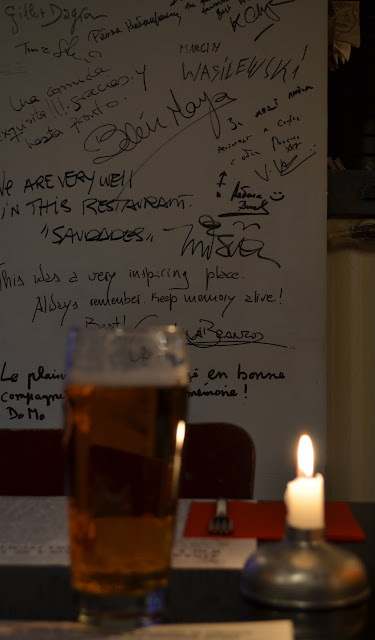 - Reservations are normally not necessary during the day, but are recommended on Friday and Saturday nights. - Prices are considered to be on the expensive side for Bulgarian salaries, which are, on average, very low compared to the rest of the EU, but are moderate for tourists with the exchange rate on their side; a meal for two (avoiding the most expensive items on the menu), with a couple of drinks, will cost you about US$25-30 total.